One of the most beautiful devotions — maybe my favorite devotion other than the Rosary — is the Our Lady of Sorrows devotion. It is a devotion that focuses on Jesus through Mary and on the enormous sacrifices and sorrows that both of them — the New Adam and the New Eve — experienced as they saved the world — literally. It especially focuses on Our Blessed Mother’s pain as she watches her son go through all these horrors — knowing that she was the one who brought Him into the world for this and she is helpless to save Him from His suffering. As a mother of two little ones, with one on the way, it just… boggles my mind that she could go through such a thing knowingly and watch her son suffer like that, completely helpless with such… courage and bravery and hope in God, even after everything seemed so terrible. Honestly, it makes me think of my own entry into motherhood. I had a rough labor for my first child, and at one point, after 43 hours of labor, my OBGYN came to me and told me that my daughter’s heart-rate was super high and they were really concerned that things weren’t going well and she needed to come out NOW. But, in doing so, it would hurt me badly, so they were hesitant on doing anything. And so, what did I want to do? And, even though I was utterly exhausted at that point and the epidural had worn off and I was in a lot of pain, I told them do whatever it was to limit my daughter’s pain, even at the expense of my own. Because, at a purely instinctive level, I wanted to limit her suffering, no matter what, because I was her mother. And even now it’s hard to see my children, now toddlers, suffer. Because part of being a mother means that watching them suffer means that you suffer as well. So, for me to meditate on the Seven Sorrows of Mary reminds me of what it means, at the most instinctive level, of what motherhood is about, because there can be a lot of suffering in motherhood. Yet, at the same time, even with all the suffering, there is always hope in God, no matter how much darkness there seems to be in the world. Anyway! This devotion is a popular devotion in the Church and was often portrayed in art. At the center, there is Mary with a sword pierced through her heart, which is an allusion of what the Prophet Simeon said to her when he met with Jesus at the Temple. Then, surrounding her are the events which are meditated on during the Our Lady of Sorrows devotion. 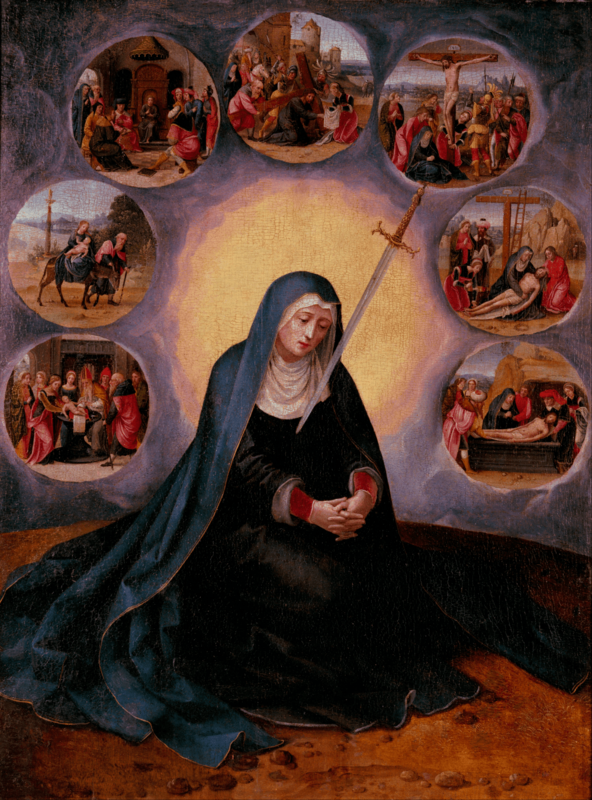 Virgin of the Seven Sorrows, by Master of the Female Half-Lengths, c. 16th century. Museu Nacional d’Art de Catalunya, Barcelona, Spain. Possible scripture readings that form the Sorrows of Mary are below! After each scripture reading, it’s traditional to take a moment to meditate on the scripture. Then you pray a Hail Mary. For the adventurous, you can also recite a chaplet, where you begin each Sorrow with an Our Father, followed by seven Hail Marys. 13 When they had departed, behold, the angel of the Lord appeared to Joseph in a dream and said, “Rise, take the child and his mother, flee to Egypt, and stay there until I tell you. Herod is going to search for the child to destroy him.” 14Joseph rose and took the child and his mother by night and departed for Egypt. 15 He stayed there until the death of Herod, that what the Lord had said through the prophet might be fulfilled, “Out of Egypt I called my son.”16When Herod realized that he had been deceived by the magi, he became furious. He ordered the massacre of all the boys in Bethlehem and its vicinity two years old and under, in accordance with the time he had ascertained from the magi. 17Then was fulfilled what had been said through Jeremiah the prophet:18 “A voice was heard in Ramah,sobbing and loud lamentation;Rachel weeping for her children,and she would not be consoled,since they were no more.”19When Herod had died, behold, the angel of the Lord appeared in a dream to Joseph in Egypt 20and said, “Rise, take the child and his mother and go to the land of Israel, for those who sought the child’s life are dead.” 21He rose, took the child and his mother, and went to the land of Israel. 41Each year his parents went to Jerusalem for the feast of Passover, 42and when he was twelve years old, they went up according to festival custom. 43After they had completed its days, as they were returning, the boy Jesus remained behind in Jerusalem, but his parents did not know it. 44Thinking that he was in the caravan, they journeyed for a day and looked for him among their relatives and acquaintances, 45but not finding him, they returned to Jerusalem to look for him. 46After three days they found him in the temple, sitting in the midst of the teachers, listening to them and asking them questions, 47and all who heard him were astounded at his understanding and his answers. 48When his parents saw him, they were astonished, and his mother said to him, “Son, why have you done this to us? Your father and I have been looking for you with great anxiety.” 49And he said to them, “Why were you looking for me? Did you not know that I must be in my Father’s house?” 50But they did not understand what he said to them. 17 and carrying the cross himself he went out to what is called the Place of the Skull, in Hebrew, Golgotha. 18There they crucified him, and with him two others, one on either side, with Jesus in the middle. 19 Pilate also had an inscription written and put on the cross. It read, “Jesus the Nazorean, the King of the Jews.” 20Now many of the Jews read this inscription, because the place where Jesus was crucified was near the city; and it was written in Hebrew, Latin, and Greek. 21So the chief priests of the Jews said to Pilate, “Do not write ‘The King of the Jews,’ but that he said, ‘I am the King of the Jews.’” 22Pilate answered, “What I have written, I have written.”23 When the soldiers had crucified Jesus, they took his clothes and divided them into four shares, a share for each soldier. They also took his tunic, but the tunic was seamless, woven in one piece from the top down. 24So they said to one another, “Let’s not tear it, but cast lots for it to see whose it will be,” in order that the passage of scripture might be fulfilled [that says]:“They divided my garments among them,and for my vesture they cast lots.”This is what the soldiers did. 25 Standing by the cross of Jesus were his mother and his mother’s sister, Mary the wife of Clopas, and Mary of Magdala. 26When Jesus saw his mother and the disciple there whom he loved, he said to his mother, “Woman, behold, your son.” 27Then he said to the disciple, “Behold, your mother.” And from that hour the disciple took her into his home.28 After this, aware that everything was now finished, in order that the scripture might be fulfilled, Jesus said, “I thirst.” 29There was a vessel filled with common wine. So they put a sponge soaked in wine on a sprig of hyssop and put it up to his mouth. 30 When Jesus had taken the wine, he said, “It is finished.” And bowing his head, he handed over the spirit. 31Now since it was preparation day, in order that the bodies might not remain on the cross on the sabbath, for the sabbath day of that week was a solemn one, the Jews asked Pilate that their legs be broken and they be taken down. 32So the soldiers came and broke the legs of the first and then of the other one who was crucified with Jesus. 33But when they came to Jesus and saw that he was already dead, they did not break his legs, 34 but one soldier thrust his lance into his side, and immediately blood and water flowed out. 35An eyewitness has testified, and his testimony is true; he knows that he is speaking the truth, so that you also may [come to] believe. 36For this happened so that the scripture passage might be fulfilled:“Not a bone of it will be broken.”37And again another passage says:“They will look upon him whom they have pierced.”38 After this, Joseph of Arimathea, secretly a disciple of Jesus for fear of the Jews, asked Pilate if he could remove the body of Jesus. And Pilate permitted it. So he came and took his body. 39Nicodemus, the one who had first come to him at night, also came bringing a mixture of myrrh and aloes weighing about one hundred pounds. 40They took the body of Jesus and bound it with burial cloths along with the spices, according to the Jewish burial custom. 41Now in the place where he had been crucified there was a garden, and in the garden a new tomb, in which no one had yet been buried. 42So they laid Jesus there because of the Jewish preparation day; for the tomb was close by. …finally! In honor of the September 15, the day in which the Church remembers Our Lady of Sorrows, this hymn is traditionally sung to honor Mary and remember Christ. I’ve included both Latin and English translations.